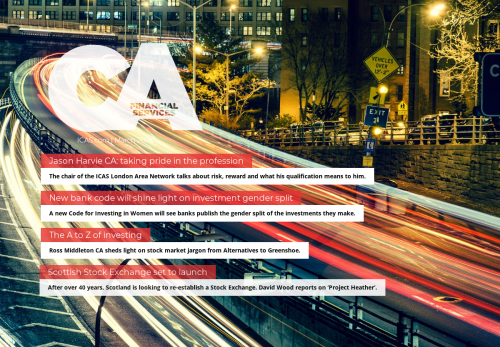 The chair of the ICAS London Area Network talks about risk, reward and what his qualification means to him. A new Code for Investing in Women will see banks publish the gender split of the investments they make. Ross Middleton CA sheds light on stock market jargon from Alternatives to Greenshoe. After over 40 years, Scotland is looking to re-establish a Stock Exchange. David Wood reports on ‘Project Heather’. Q&A with the founder of SmartCats Consulting, investor relations insight and equity crowdfunding for books.